With almost 100 illustrations. 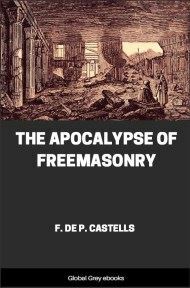 This book presents details of Masonic initiation rituals, along with grips, passwords and regalia. 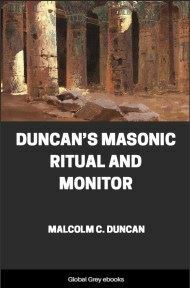 Written in the 19th century, Duncan's Ritual, as it is known, has been republished numerous times. It includes the three basic degrees of the Ancient York Rite, and four additional advanced degrees. Seven Freemasons, viz., six Entered Apprentices and one Master Mason, acting under a charter or dispensation from some Grand Lodge, is the requisite number to constitute a Lodge of Masons, and to initiate a candidate to the First Degree of Masonry. 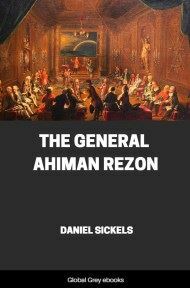 They assemble in a room well guarded from all cowans and eaves-droppers, in the second or third story (as the case may be) of some building suitably prepared and furnished for Lodge purposes, which is, by Masons, termed "the Ground Floor of King Solomon's Temple." The officers take their seats, as represented in the Plate on page 8. Lodge-meetings are arranged as follows, viz. : a "regular" is held but once a month (i.e. every month on, or preceding, the full of the moon in each month); special meetings are held as often as the exigency of the case may seem to demand, if every night in the week, Sunday excepted. If Tuesday should be Lodge night, by Masons it would be termed, "Tuesday evening on or before the full of the moon, a regular night." All business relative to Masonry is done at a "regular," and in the Third, or Master Mason Degree. 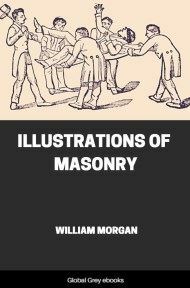 None but Master Masons are allowed to be present at such meetings; balloting for candidates is generally done on a "regular," also receiving petitions, committee reports, &c., &c.
A petition for the degrees of Masonry is generally received at a "regular" (though, as a common thing, Grand Lodges of each State make such arrangements as they may deem best for the regulation of their several subordinate Lodges). 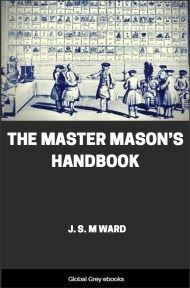 At the time of receiving a petition for the degrees of Masonry, the Master appoints a committee of three, whose duty it is to make inquiry after the character of the applicant, and report good or bad, as the case may be, at the next regular meeting, when it is acted upon by the Lodge. Upon reception of the committee's report, a ballot is had: if no black balls appear, the candidate is declared duly elected; but if one black ball or more appear, he is declared rejected. No business is done in a Lodge of Entered Apprentices, except to initiate a candidate to the First Degree in Masonry, nor is any business done in a Fellow Crafts' Lodge, except to pass a Fellow Craft from the first to the second degree. To explain more thoroughly: when a candidate is initiated to the First Degree, he is styled as "entered;" when he has taken the Second Degree, "passed." and when he has taken the Third, "raised" to the sublime Degree of a Master Mason. 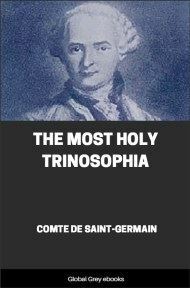 No one is allowed to be present, in any degree of Masonry, except he be one of that same degree or higher. The Master always wears his hat when presiding as such, but no other officer, in a "Blue Lodge" (a "Blue Lodge" is a Lodge of Master Masons, where only three degrees are conferred, viz. : Entered Apprentice, 1st; Fellow Craft, 2d; Master Mason, 3d. Country Lodges are mostly all "Blue Lodges"). A Lodge of Fellow Craft Masons consists of five, viz. : Worshipful Master, Senior and Junior Wardens, Senior and Junior Dear hens; yet seven besides the Tyler generally assist, and take their seats as in the Entered Apprentice's Degree. The Fellow Craft Lodge is styled by Masons "the Middle Chamber of King Solomon's Temple." Three Master Masons is the requisite number to constitute a Masters' Lodge, which is called by Masons "the Sanctum Sanctorum, or, Holy of Holies of King Solomon's Temple." Although three are all that is required by "Masonic Law" to open a Third Degree Lodge, there are generally seven besides the Tyler, as in the other degrees. All the Lodges meet in one room, alike furnished, for the conferring of the different degrees (E. A., F. C., and M. M.); but they are masonically styled by the Craft as the Ground Floor, Middle Chamber, and Sanctum Sanctorum. A person being in the room, while open on the First Degree, would not see any difference in the appearance of the room from a Master Masons' Lodge. It is the duty of the Tyler to inform all the brethren on what degree the Lodge is at work, especially those that arrive too late (i.e., after the Lodge has been opened). so that none will be liable to give the wrong sign to the Worshipful Master when he enters. If the Lodge is opened on the First Degree, there might be present those who had taken only one degree, and, if the brother arriving late should be ignorant of this fact, and make a Third Degree sign, they would see it; consequently, caution on this point should always be given to such brethren by the Tyler, before entering the Lodge.